Set in a river boat community in Arkansas in the 1930s, this poignant story chronicles Aiyana Weir's spirited determination to break away from a life, like that of the women around her, defined and dominated by brutal patriarchy. Born in Somerset, Avril Joy worked for 25 years in a women’s prison in Durham and came late to writing yet has won the Costa Short Story award and has been short-listed for the Bridport, the Manchester Prize for Fiction and The Raymond Carver Short Story Prize. work of haunting beauty which celebrates the courage and resilience of the human spirit. An amazing, beautiful book…echoes of Eimear McBride. Joy knows how to draw you into the story, right into the soul of the narrator. Author, Kathleen Jones – What Am I Reading? Exquisite rendering of a river setting…immersive, moving, although there are shocking and brutal events there is beauty and hope in abundance, not to mention love. Isabelle Coy-Dibley, The Contemporary Small Press. I felt, by the end, that I had been reading an epic tale, not a novel – rhythmic, mystical, poetic. The voice and the soul of Aiyana have stayed with me long after reading this magical book. it has a special quality that speaks to every sense and, most of all, to your heart. This is my favourite of the shortlisted books. The evocative descriptions through this powerful young woman's eyes fill the senses and transport you to the Arkansas riverbank to learn and grow with her. If it was ever in doubt that knowledge is power, it isn't now. A standout novel with distinctive voice, lyrical prose and emotional power. Deserves a much wider audience! The novel draws the reader into the atmosphere and the psychology of the protagonist; all the elements pervaded by the song of the river - wonderful. 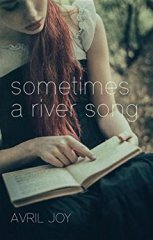 Avril JOY - Sometimes a River Song I loved this beautiful book. In its short – 190 – pages, I was drawn into a world both unfamiliar and familiar. A riverboat community in Arkansas in the 1930s is far removed from my experience; yet Aiyana Weir’s story of growing up in a world defined and dominated by men is all too familiar. Through her voice, we learn of the expectations of this river community – brutal patriarchy, arranged marriages, secret deals, cruel neglect… Aiyana is determined to break away from this world – to ‘leave the river’ – and, in secret, she pursues literacy denied her by an abusive father. There are heartening moments – an understanding grandmother, a somewhat mythical character who introduces wisdom; a good brother, Lyle who is always on her side; the story of a single photographic image; and, in a lovely twist on the ‘deals’ of this community, it is Aiyana who gains some access to learning to read. Yes, there are shocking, brutal events and turmoil for Aiyana; but, more than this, there is celebration of a young woman’s bravery, determination and resilience. The book reminds us of the power in women to transcend their birth destiny. Read this book – it is an accomplished, beautifully written novel. This is a very engaging book, tackling important issues relating to violence and abuse against women in a very creative and literary style. I was mesmorised by the book, which conjures up a very visual and embodied picture of the tough life on the river in 1930s Arkansas. An excellent read; set in a community of river people, narrated by a young woman with a striking voice that sings through. Loved this book. Would highly recommend. Get it and read it... you won't be disappointed. Beautifully written. This author has real class. A powerful yet tender, thought provoking book. This is a text that is incomparable to any other with its visceral prose and haunting narration. Aiyana's unforgettable voice is intelligent and emotionally intuitive despite her illiteracy. She narrates her inner world through the motions of nature, immediately pulling the reader into a colourful landscape with her beautiful vignettes of movement and feeling. However, the threat of violence constantly lingers in the background through the patriarchal riverboat community she lives in. It mainly comes in the form of her father and it ensures she cannot stay even though it is the only home she has ever known. Intercepting her narrative, we are given a different point of view through Silas, the stranger her father brings home who is hiding secrets of his own. The impressive jump in narrative voice from Aiyana to Silas further highlights Avril Joy's tremendous talent for words, voices, storytelling and rhythm. Sometimes A River Song is a short text, but not one that compromises on aftertaste. The story will stay with you, and you will find yourself on the verge of tears as you finish with Aiyana's voice under your skin and the river song in your heart. The best written book I've read in ages. I could feel the damp of the river, inhale the smells of the river, feel the daily challenges facing the amazing variety of characters. Such an original story, written with good pace, it grips you and you don't want to put this book down. Nor should you. It's one not to be missed. Extraordinary - the best and most unique novel I've read so far this year. It would be a worthy winner. An outstanding achievement -at once beautiful and hauntingly evocative.. Fascinating and poetical in form. Totally spellbinding! One of the most beautiful books I've read this year. Aiyana's voice is naive and wise, strong and vulnerable as she chronicles her life at the hands of brutal men, and makes plans to leave her beloved river. Avril Joy describes the backdrop of the river community in such vivid detail that we live there, in the dry seasons and in the snow, through kindness and cruelty, beside Aiyana and her wise grandmother, her loyal brother Lyle and his dog Castor. We are drawn into the heart of this moving story and into the moods of the river as both wend their way towards their inevitable endings. Beautifully lyrical. You are swept along the river as you read. It's a tale of cruelty, of an unfair society, but it's lifted out of misery through the strength and love of the women who fight together for a better life. A uniquely lyrical voice. Unforgettable.